Due to the custom nature of this product, returns are not accepted. 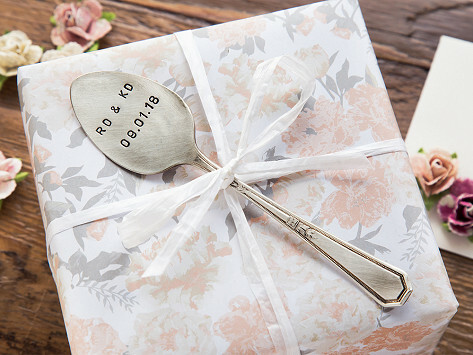 Vintage spoons are handcrafted into sweet and meaningful markers that make the perfect addition to a gift or a garden. Customize a spoon with a hand-stamped message, name, or date (up to 15 characters) to truly make for a one-of-a-kind finishing touch. Dimensions: Size Ranges: 6"- 9" x 2"- 3" x 0.2"- 0.5"
This is the Mrs. and all my friends I gave these to thought these were so unique and just loved them! I have ordered 13 of them! Thank you! Vintage spoons get a second chance to shine thanks to Maker Karen Ngai of Monkeys Always Look. Karen sources spoons from flea markets, auctions, and yard sales around the country to create her one-of-a-kind markers. Karen flattens and hand-stamps each spoon in her San Diego studio. You can pick a spoon that already bears a phrase—like Celebrate, XOXO, or Thank You—or you can customize your own with a name, date, or short message. Whether you use a spoon as an add-on to a gift, as a garden marker, or a token of thanks, it’s a special and unique touch that makes for a thoughtful and beautiful presentation.